Initially the Belarus flag was red and was used in 1917. When the communist party took over, an ensign of ???? in gold at the upper left hand corner was added. In 1937, a gold hammer, sickle and star were added on the top of the letters, which were changed to ????. A gold border was added to the letters and the hammer, sickle and star were removed in the 1940’s. The letters were eliminated and the hammer, sickle and star reemerged in 1951. Between the years 1991 and 1995 a flag with horizontal red and white stripes was flown. In 1995 a new flag design was proposed, at which point the current flag emerged. It features a large horizontal red stripe with a narrow green stripe beneath it. On the left side is a traditional Belarus design in red and white. 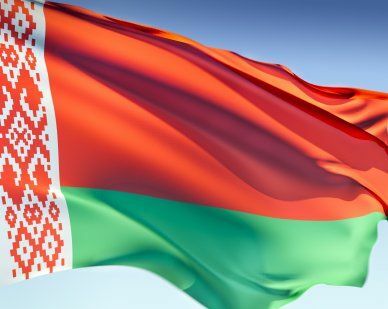 Our top-quality Belarus flags conform to all official specifications. Emblems and designs are executed with the highest possible degree of accuracy in regard to detail, color shades, placement and proportion to flag size.